Crotona Park East. Image: Courtesy of Dattner Architects. Proposed 1,300-unit project near the Bronx River led by Gifford Miller would include a mix of affordable and market-rate apartments. 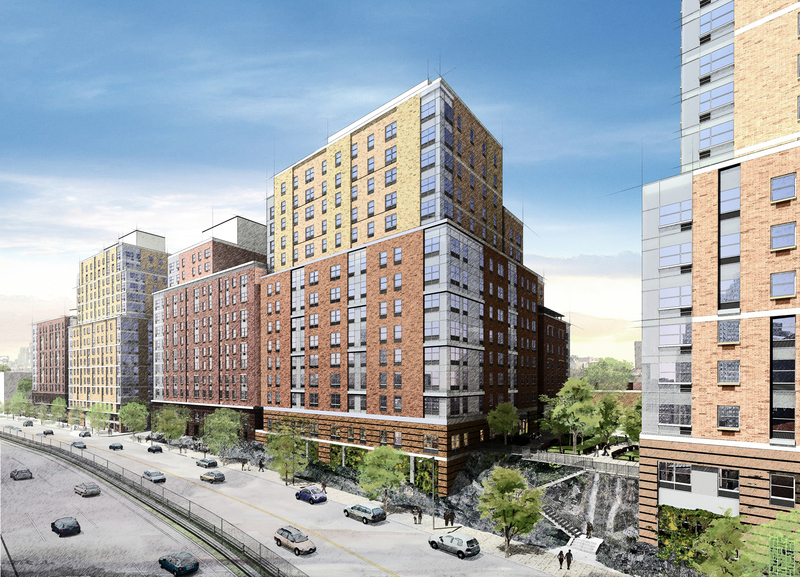 On October 5, 2011, the City Council approved Signature Urban Properties’ proposal to build a ten-building mixed-use project overlooking the Sheridan Expressway and the Bronx River in the Crotona Park East and West Farms sections of the Bronx. To facilitate the approximately 1,300- unit project, Signature submitted multiple applications including a proposal to rezone an eleven-block area generally bounded by Boston Road to the north, Freeman Street to the south, West Farms Road to the east, and Boone Avenue to the west. Signature proposed rezoning the primarily industrial area from M1-1 to R6A, R7A, R7X, and R8X districts with C2-4 commercial overlays. Signature proposes to build seven buildings along two blocks of West Farms Road and Boone Avenue between East 173rd and Jennings Streets and divided by East 172nd Street. Signature first plans to develop two buildings on the northern portion of the block bounded by East 172nd and Jennings Streets. The buildings will range in height from three to nine stories along Boone Avenue and from nine to fifteen stories along West Farms Road, and will include 237 residential units and 130 underground parking spaces. Five buildings will be developed on the block to the north, which will be divided by a 60-foot wide landscaped open space. To the south, two buildings will range in height from six to thirteen stories and include 288 apartments, ground floor commercial space along Boone Avenue and a central courtyard with a public playground. Signature will provide space for a six-story elementary school in one of the three buildings on the block’s northern portion. If the School Construction Authority elects to build the school, Signature would create a total of 317 apartments in the remaining floor area. The three buildings would include a total of 370 apartments if the SCA does not build the school. Three more buildings will be built outside project’s main footprint. A seven-story building with 26 units will be developed on the western side of Boone Avenue between East 172nd and East 173rd Streets. Two blocks to the north, on East 176th Street and Rodman Place, Signature will build two fifteen-story towers with a total of 394 apartments. At the City Planning Commission’s public hearing in September, representatives from labor unions opposed the proposal, claiming that Signature had refused to commit to using unionized labor for the project. Representatives from the Bronx River Alliance and the Pratt Center for Community Development expressed concern about the project’s impact on the Bronx River Greenway and surrounding open space. Gifford Miller, principal of Signature and former City Council Speaker, testified that the project would help revitalize an underutilized industrial area. Miller estimated that at least 50 percent of the project’s housing would be affordable. In response to the union concerns, Gifford testified that Signature would be open to using union labor if financially feasible. The Planning Commission approved the proposal, while noting that the Department of Parks and Recreation would require Signature to mitigate development impacts on open space in the area. At the Council’s subsequent Zoning & Franchises Subcommittee hearing, representatives from Planning, the Parks Department, and the Department of Housing Preservation and Development all testified in support of Signature’s proposal. The project is located in the districts represented by Council Members Maria del Carmen Arroyo and Joel Rivera. Arroyo expressed concern about the project’s impact in a community already lacking in open space. She asked Planning and the Parks Department to make firmer commitments about how to protect open space. Rivera acknowledged that there were legitimate concerns about the project’s impact, but believed that the proposal would be the best use for the site. The vote was laid over. When the Subcommittee reconvened, Chair David Weprin announced that Parks had submitted a letter detailing its commitment to evaluate current opportunities to improve open space, and to monitor how the Signature project and other projects in the rezoning area would impact open space in the community. Parks also committed to consulting with the community and local Council Members on a yearly basis to discuss capital projects and programmatic needs. According to Weprin, Council Member Arroyo was satisfied with the commitments. The full Council approved the project by a vote of 43-1-2. Council Member Charles Barron voted no, and Council Members Helen D. Foster and Jumaane D. Williams abstained. Council: Crotona Park East/West Farms Rezoning Text Amendment (C 100310 ZMX – rezoning); (N 100311 ZRX – text amend. ); (C 100312 ZSX – spec. perm. ); (C 100313 ZSX – spec. perm. ); (C 110297 ZSK – spec. perm. ); (C 110234 HAX – UDAAP dispo.) (Oct. 5, 2011) (Architect: Dattner Architects).